Generations of Boy Scouts, primed with suitable ghost stories, have undertaken nocturnal expeditions routed to include a visit to this grave. To these youthful witnesses, even the mundane movements of startled sheep scurrying away in the darkness are said to have turned the most dedicated sceptic various shades of white. Most of our less romanticised tales about this grave originate from a leaflet published in 1909 to commemorate the bi-centennial of Worthington's death. This meticulously researched document identifies tradition rather than fact as the basis of current knowledge about the internee. Reputedly born of Catholic parents about 1659, as a result of early contacts with dissidents Roger Worthington is said to have renounced his faith and become Nonconformist, possibly Baptist. Ostracised and forsaken by his family, he resorted to ministering to an isolated flock on the moorlands between Bury and Bolton. An entry in the Bury parish registers identifies him as a Dipper, a reference to his practice of baptising converts in a pool at the front of his home at Holcome Hey Fold Farm. The original stone, now fragmented, was complemented by a replacement set immediately alongside it in July 1935, when the adjoining area was dedicated as a place of public solitude. 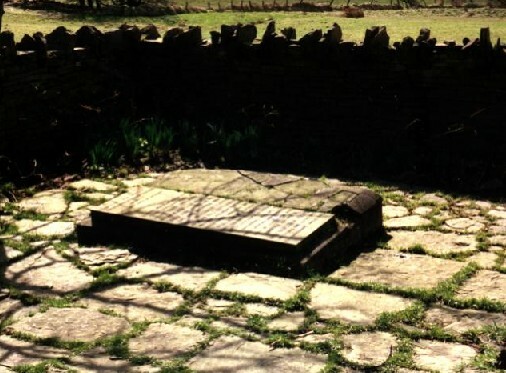 The grave lies within the Greater Manchester boundary midway between Ramsbottom and Edgworth. It can be found at the northern end of a rough lane leading from Hawkshaw Post Office towards Grainings Farm, about 100 metres before the latter.